If you own or manage a QSR with a drive-thru lane, you know how important good communications between your staff and your customers are, and how difficult it can sometimes be to maintain a solid connection. After all, mealtime is when customers want to unwind, relax and enjoy that cheeseburger special that’s been on their minds all afternoon. The last thing they want is to have to repeat their order, maybe twice, and still sometimes get the wrong items. It slows down your throughput, increases frustration all around. And, if it happens too often, you might lose a customer. Drive-Thru headsets are different than ordinary headsets. They have to be, because of the incredibly tough environments within which they function. Your drive-thru lane, no matter well designed is, after all, outdoors, where your customers’ voices must compete with all manner ambient noises. And, the same customer contact staff that struggles to understand what your customers want also has to communicate with kitchen staff, whose working environment is more noisier still. Both job functions require that staff must be equipped with drive-thru headsets. Reducing Noise is vital for good drive-thru communications. Through advanced digital technology, drive-thru headsets recognize and eliminate acoustic pollution such as the revving of engines, automobile exhaust noise, and the sounds of traffic. They also cancel out unwanted kitchen noise, such as running water and the sounds generated by commercial food preparation equipment. Cancellation of Echoes, too, is an important benefit, and that’s because noisy drive-thru environments are rift with metallic surfaces such as digital menu boards, speaker posts and the vehicles themselves. The human voice bounces off these highly reflective surfaces, return, and create echoes in ordinary headsets. But drive-thru headsets are specifically designed to digitally eliminate this hazard. 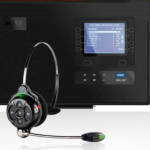 Wide Audio Bandwidth is another factor that’s important for good communication, because your staff needs to be able to communicate with all of your customers, regardless of the pitch of their individual voices. A good drive-thru headset does not skimp on bandwidth. High-quality drive-thru headsets will make for faster, easier communications all around, which will result in less stress for everyone and in a more smoothly running QSR operation.